In February, Matthias Clasen started a series of blog posts about Fedora Atomic Workstation (now Team Silverblue) and Flatpak. I gave it a try to see how the container would work with the documentation tools. The screenshot below shows the setup I used to submit this merge request. The buildah container is in the shell window on the right where git and Emacs operate in the /srv directory. At the same time on the Silverblue desktop, gitg and Yelp see the same files in the /var/srv directory. Emacs bindings for Mallard are courtesy of Jaromír Hradílek. This entry was posted in Uncategorized on July 11, 2018 by mdhill. I’m feeling extremely grateful for the shot in the arm GUADEC provides by way of old friends, new friends, expert advice, enthusiasm, time-worn wisdom, and so many reminders of why we do this. I use FreeCAD for freelance work, and build the development version from git periodically. There is a copr nightly build for recent versions of Fedora, but not for Rawhide. The first person to whom I related this experience, David King, said the software would be ideal for the Flatpak treatment. Since then I’ve been getting a tutorial on building the YAML manifest, and after four days of hard work (thanks Dave! ), it’s on the very brink of completion. On the docs front, having adapted to GitLab and getting a merge request committed to the Desktop Help in the spring, it’s time to refresh some of the topics. I’ll be starting with the Settings pages. A couple of jokers photobomb André’s portrait session. Thanks to Ismael Olea, Rubén Gómez and the organizing team for a spectacular event and a wonderful cultural experience! 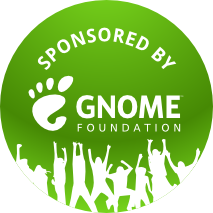 Thank you GNOME Foundation for the sponsorship. This entry was posted in Uncategorized on July 10, 2018 by mdhill. My favourite CAD software used to run on at least ten different platforms, including my trusty SGI Indy. There was even a Linux student version. Evidently the market spoke, and for nearly twenty years the software has been Windows-only. Between IRIX and Linux, I’ve never had a need to allow Windows across the threshold (not least because I could get my fill by going to work). Six years ago I needed to run the CAD software at home again, so I bit the bullet, bought a Windows DVD and started dual-booting it on a desktop machine. Sensing the completion of the work, the hard drive died, and I dismantled the computer. When I needed to reinstall the CAD software this year for some freelance work, I used the DVD to install Windows into Boxes on my laptop. In the spirit of the Bill Gates quote that never happened, I specified twice as much disk space as I could ever imagine needing. Naturally, the OS and app together consumed the alotted disk space to within a few kilobytes. I needed to resize. Since the drive resizing I’ve been able to downgrade the CAD software to an earlier version, so 40 GB probably would have been plenty. I think I’ll leave it, though, because my laptop is relatively new and has all the disk space I could ever need. The lesson might appear to be Windows’ disinclination to be contained, but a licensing issue with the CAD software took a few weeks to resolve. In the interim I continued to do remarkable things with FreeCAD. I’ll use the proprietary software for details related to transferring the files, but FreeCAD is very close to keeping my CAD experience Windows-free. This entry was posted in Uncategorized on June 30, 2017 by mdhill. 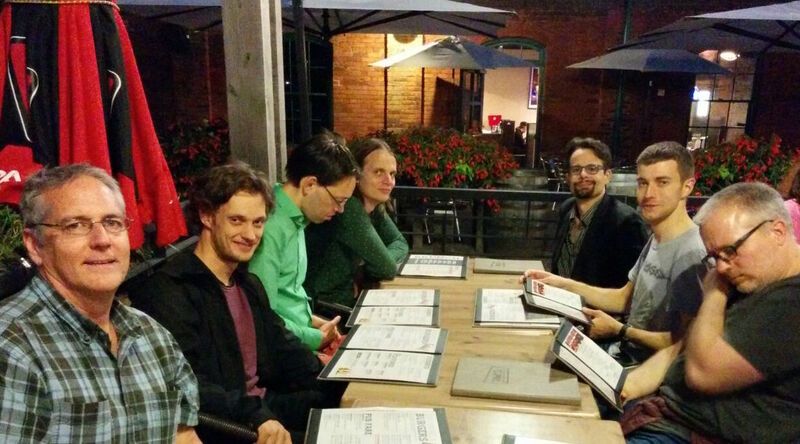 Last March, the Toronto area GNOME 3.20 release party happened to fall on release day. This release day saw Nancy and me at the hospital for the birth of our second grandson, Gord and Maggie’s second boy. Name suggestions honouring the occasion (GNOME with any manner of capitalization, Portland, or Three Two Four) were politely rejected in favour of the original plan: Finnegan Walter “Finn” Hill. Welcome to Finn and the new GNOME. This entry was posted in Uncategorized on March 23, 2017 by mdhill. I had the privilege of sitting in on the GTK+ hackfest in Toronto last week, getting re-energized for my day job by hanging out with developers from Canonical, Collabora, Endless and Red Hat. Toronto is a fabulous city for a hackfest, and Red Hat provided a great workspace. While there, I reviewed some user help and updated some of the Settings pages. The Transformer makes a good hackfest computer, lightweight enough for a great deal of walking, and comfortable to use when paired with the right keyboard. Remarkably, it has sufficient resources for running Continuous-in-a-Box. There’s nothing quite as dramatic as a GNOME controversy at its epicentre. The decision-making process is as open and visible in person as it is on IRC. There is no behind the scenes. This entry was posted in Uncategorized on June 22, 2016 by mdhill. After successfully building 32-bit kernels using the Fedora method, I decided to try 64-bit Linux on my ASUS Transformer Book T100TA. The Debian multi-arch installer successfully deals with the 32-bit UEFI boot installation, and even better, certain pre-packaged Ubuntu kernels can simply be installed. Here’s my experience with the upgrade. I started with the DebianOn ASUS T100TA wiki page. Particularly crucial is the grub command line switch for the cstates issue. After a bit of trial and error with the install isos— couldn’t locate the correct wifi firmware on the Jessie non-free firmware netinst iso, the Alpha 5 Stretch multi-arch DVD iso would start but never complete the install to the eMMC drive—I settled on the Jessie multi-arch DVD iso with 3.16 kernel. This gave me a running Cinnamon desktop—the iso didn’t contain sufficient packages to switch to GNOME. switched to NetworkManager and re-installed the wifi firmware (the latter seemed to fix the issue of the connection cutting out). installed non-free intel-sound firmware and the t100_B.state file, then applied Vinod Koul’s settings for working audio (be sure to keep the volume down for testing). enabled and started ModemManager and installed the mobile-broadband-provider-info package to tether my phone. 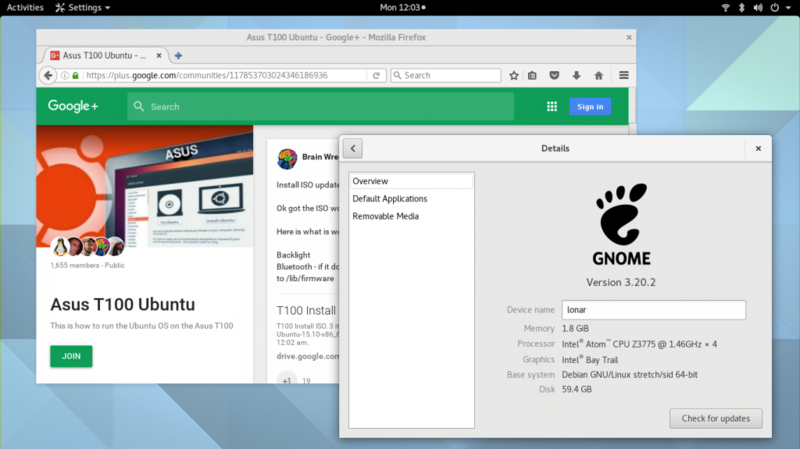 The ASUS T100 Ubuntu Google+ community is a volunteer effort geared toward establishing which kernel patches, firmware, and configuration settings are required to get the hardware in the various T100* models working in Linux. Although the stock Debian Stretch kernel (4.5.0) boots with working wifi, the Ubuntu kernel packages from the G+ page (4.4.8.2 and 4.4.9.1) boot with working wifi, sound, mobile broadband, and Bluetooth. There’s still work being done on the camera driver and I haven’t tried anything with the touch screen, but at the moment my GNOME tablet experience is reasonably complete. This entry was posted in Uncategorized on May 23, 2016 by mdhill. 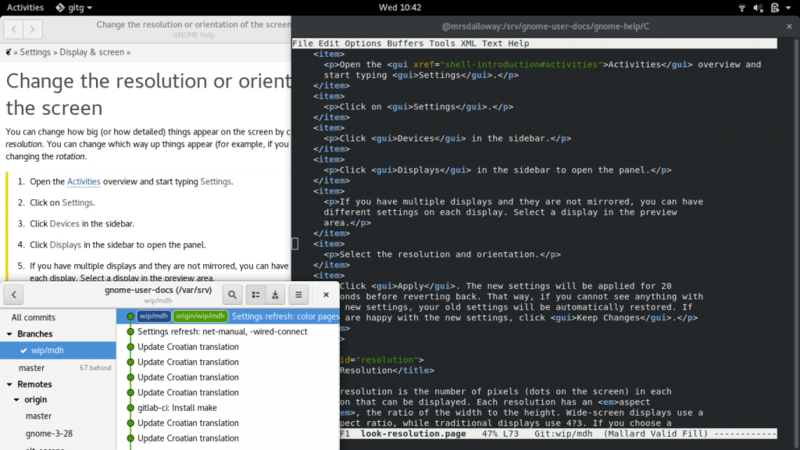 As Pa Bailey might have put it, it’s deep in the race to want to run GNOME on your tablet. At last year’s Libre Graphics Meeting in Toronto, pippin displayed GNOME on his Lenovo MIIX 3 Bay Trail device. A few months later I was able to pick up an ASUS T100TA with similar specs (if not as elegant) for a good discount. Adam Williamson’s latest Fedlet release was days old at the time, and I installed it. ‘dnf upgrade’ on the newly-installed Fedlet led directly to the first from-scratch re-install. Since then I’ve installed specific required packages with dnf using ‘–best –allowerasing’. I’m still running Fedora 23 to prevent the loss of any of the customized packages (other than the kernel) from the Fedlet repo, but hopefully it will become possible (if it’s not already) to do without them. I would experiment, but at this point it’s easier to just avoid the risk. the last re-install was required after I built a kernel that was capable of eating the contents of the eMMC hard drive. 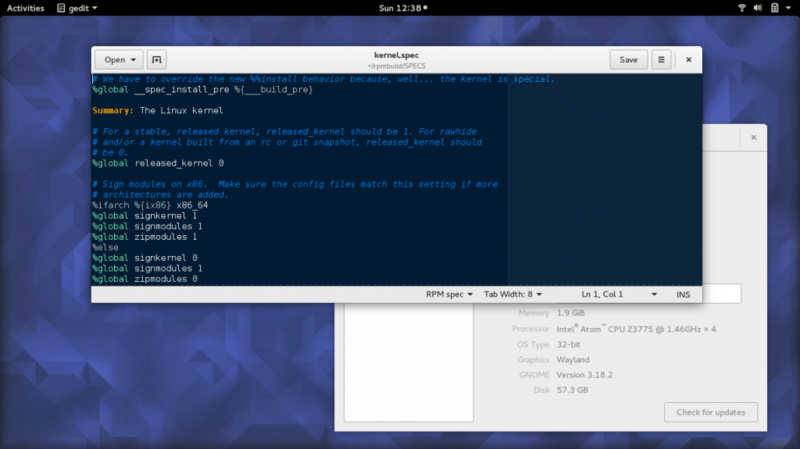 sometime between 4.2 and 4.6, a dracut upgrade was required to enable the kernel installation to complete. the 60 GB hard drive needs a hefty percentage of free space to perform the build: I usually delete the contents of BUILD and BUILDROOT from the previous build, and keep my music on the removable SD card. Asus T100 Ubuntu: progress reports, patches and config file, sound configuration (sound works with kernels older than 4.6-rc* but so far 4.6 breaks it). The About this community panel has a Google Drive link called Asus Files with all the good stuff. These are the sections I follow from Building a custom kernel. Please consult the original page for the details. I grab the kernel source package from Koji that corresponds to the patches in the Google Drive folder. Use ‘target=i686’ if building on my x86_64 laptop (hypothetical at this point since I haven’t successfully done this). Skip this section: at this point I apply the patches (from the Google+ page) directly to the linux-* folder. I’ve performed the operation of copying the tree to create a single patch, but haven’t been successful automating it with ApplyPatch in the .spec file. Copy in the config file acquired from the Google+ page. Customize the buildid in the .spec file (.mdh in my case). Use ‘noprep’ to prevent refreshing the source tree and re-applying the Fedora patches. Use ‘target=i686’ if (someday) building on my x86_64 laptop. On occasion at this point I need to rename the ~/rpmbuild/BUILD/kernel-*/linux-* folder to include the buildid and fc23 instead of the version from the source rpm (currently fc25). I usually do the last step with the power connected, but occasionally carry it to the car and back for the trip to work, so as not to interrupt the build. If it finishes, a full set of packages should appear in ~/rpmbuild/RPMS/i686. This entry was posted in Uncategorized on April 24, 2016 by mdhill. 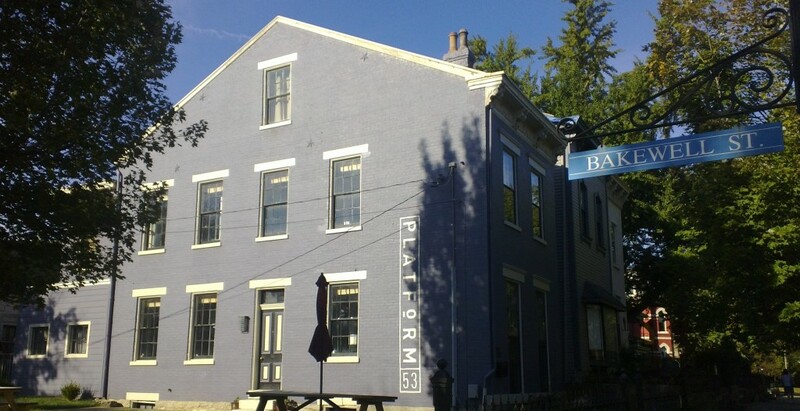 Platform 53, a remarkable co-working space in Covington, Kentucky (across the river from Cincinnati) was the setting for GNOME’s Open Help doc sprint this week. We spent three intense days updating the GNOME User Help for 3.18. I reviewed and updated the networking pages to reflect a number of changes. A big part of our mission is to test all of GNOME’s features so we can write accurate help pages, and find out what works. A number of issues were uncovered and reported, and some of the solutions will be implemented in 3.18.1. The Documentation Team is a perfect mix of writers, developers, friends. 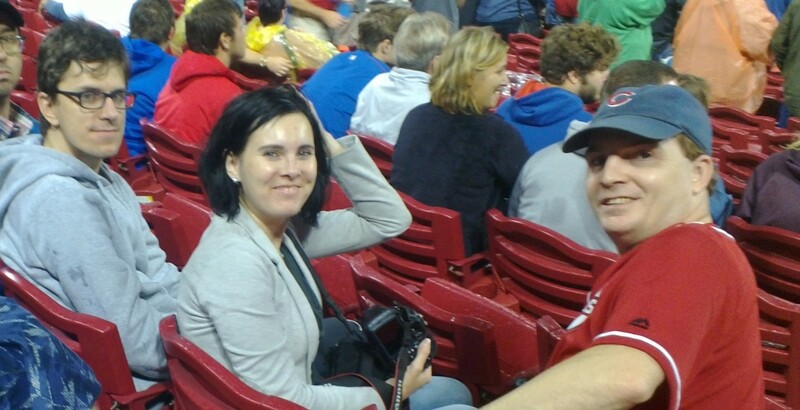 As a team-building exercise, Cincinnati treated us to a Major League Rain Delay, followed by a baseball game. Our productivity was heightened by a prodigious amount of walking around the city and over the river. Many thanks to Shaun McCance for organizing a sensational event, and Syllogist and Red Hat for sponsoring it. Thanks to the GNOME Foundation for enabling me to attend. This entry was posted in Uncategorized on October 2, 2015 by mdhill. It was a rare spring day in April when a visiting dignitary from Norway prompted a spontaneous release party. This entry was posted in Uncategorized on May 1, 2014 by mdhill. Here’s an awesome idea… schedule FOSDEM right after a docs hackfest! A hired carload of us accompanied Kat and Dave from Norwich, on the Eurotunnel Shuttle. We brought Mallard balls. 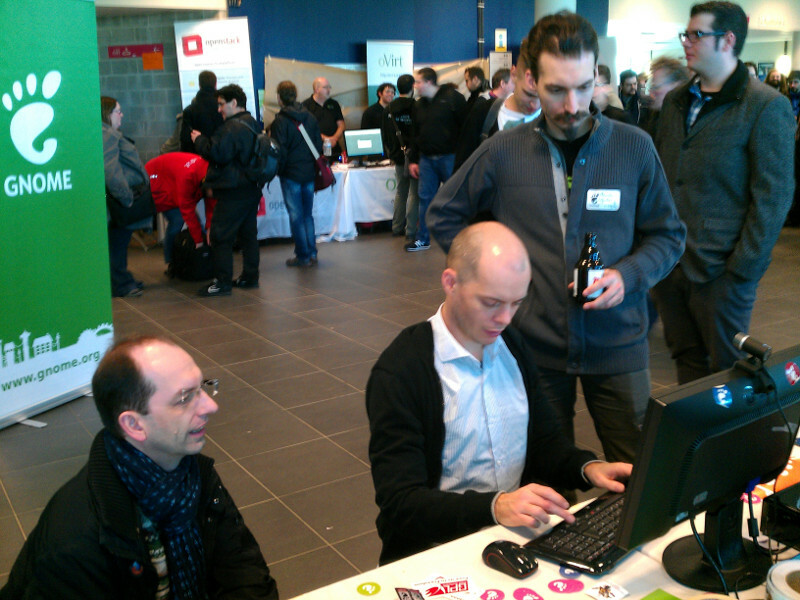 It was a blast working in the GNOME booth on Sunday afternoon, alongside Alexandre, Nathalie, Tobi, Fred, and Baptiste. The enthusiasm of Tobi and Bastian Ilsø was infectious. In the spirit of catching flies with honey, Alexandre and Baptiste used the Mallard balls to good effect promoting Mallard. Baptiste et Alexandre s’allient afin de donner une démonstration en profondeur après une pêche fructueuse à l’aide d’une balle Mallard. This entry was posted in Uncategorized on February 9, 2014 by mdhill.